Its hard to believe that winter is nearly over and spring is close by. A few early robins have been sighted in the area, but the juncos have not yet departed for Northern Canada, suggesting that "Old Man Winter" has still a few more events planned. Below is the Spring - Summer - Fall "Schedule of Events" put together by the Williamsville Depot Steering Committee for 2018. It's an ambitious list that we hope will draw even larger crowds than we enjoyed last year. We hope that all of you will find one or more events that you'll be sure to enjoy! See you at the Depot! 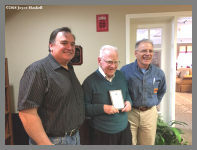 Society, was presented with a plaque honoring his work. 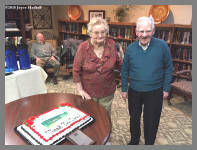 The presentation at "The Amberleigh" Senior Living Community Center was followed by coffee and a cake enhanced with an icing photo of the Williamsville Depot. Don, thank you for leading us, sometimes kicking and screaming like children, through this period. The improvements at the Williamsville site reflect the astounding benefits of your teachings. 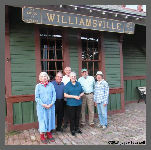 Our "Williamsville Dreamin" article in the January issue of the "Railway Flyer" was devoted to the wishes of the Williamsville Depot steering committee for a small engine of a type owned by the Lehigh Valley Railroad to place in front of our boxcar and caboose, representing a small train. Well, thanks to Devan Lawton, we found one! It is an ALCO - S2 and was purchased by the Lehigh Valley in 1942 as #151. Currently, it sits quietly on a siding serving as a parts donor, and has not moved under its own power in probably more than a decade. The body is fairly complete, but there is no builder's plate and the cab is another matter. On one of the few warmer days in March, we sent a small party (Devan Lawton, Marty Visciano, Mark Klepadlo and Joyce Haskell) to examine this most unique piece of memorabilia and to take photos of it for the rest of the Steering Committee to review. These photos were taken on that visit. Up until this point, all sounds "dreamy". BUT (there is always a "but", isn't there?) the price is almost twice the scrap value of the piece. Since the current owner is in no hurry to sell, the price does not appear to be negotiable. However, the owner's representative did say that should another interested potential buyer appear, he would let us know. Purchase price isn't the only problem. Winter's Rigging indicated that it would cost at least as much as that purchase price just to move the engine to our location. And then, of course, there are the costs related to cosmetic preservation. And those of rebuilding the engine's cab. Hmmm. Since this S2 has been sitting quietly for many years, there is no rush. It isn't going anywhere any time soon. 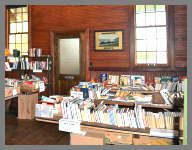 The Depot Steering Committee will explore fund raising and grant possibilities. Our first official event of 2018 was a spaghetti dinner held April 7th at the Cleveland Heights Christian Church on Union Road. 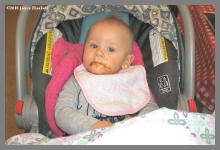 It was a tremendous success and no one left hungry! Guests were also entertained by Marty Bauer, who presented and excerpt from this summer's first production, "A Stop in Time" about Robert Percy's unanticipated adventures during a train stop in a small town in Ohio. Written and directed by Marty Bauer, the play will be presented at the Williamsville Lehigh Valley Depot on the evenings of June 8th & 9th and again on the 15th and 16th. Tickets are $8 at the door, $6 for seniors and students. This season there is much work to be done on the depot and on the equipment that we already have. 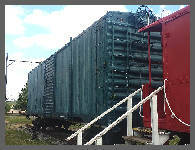 First off is the installation of electric power in the boxcar so that it can be used as a shop as well as storage area. The power will run through the conduit placed last fall by our "Urban Archeologists". Since we have already started to raise money to "Paint the Boxcar", we had better get started. Some sanding and priming will show that work has been initiated while we continue to raise more funds. To learn from the experiences of others, a large contingent from our Steering committee visited the Museum of the Niagara Frontier Chapter of the NRHS, to examine their Erie Caboose, painted by Chapter members at about the same time as our Lehigh Valley caboose. The paint on their Erie caboose is in excellent condition, considering its exposure to the elements. We also learned some things about the display of their equipment. In the depot, the chimney must be inspected (and probably repaired and relined) to pass fire inspection. The passenger waiting room stove was a major concern. An estimate of the cost of repair came with no guarantees of long-term serviceability. It now has been replaced by another similar stove in very good condition, which will burn wood and coal to heat the waiting room during the spring and fall, expanding availability of the space for events and work parties. Finally, we will be needing enhancements of the present security system to cover the blind spots that we have identified. The agent's office is another area of concern. Another attempt will be made to strip the many coats of paint applied over a century and a quarter. As announced almost a year ago, a pending "land swap" between the Village and a private developer could bring the old Lehigh Valley section house and crew quarters onto public land, raising the possibility that this structure might become part of the Lehigh Valley Depot Historic Site. After initial preparation by the Village, a joint collaboration between the Village and the Depot Steering Committee might bring the Section House to a level where it might be used by both for various events without being a fiscal drain on the Society. May 11th condition update: The section house, that has been mentioned in previous Flyers, is now finally boarded up so the no further vandalism should occur and the risk of fire is reduced. The final disposition of the building is still in limbo. Tom Stackhouse reported that a 1917 map showed that there were two Lehigh Valley tracks running in front of the depot, and a siding running behind the depot that extended all the way to the section house. We found remnants of this side track when we visited the section house last year. That map indicated that there was a proposed lease of the section house to Frank Duke (actually, D'Ugo), the Lehigh Valley section foreman, at a rate of one dollar per year, for occupancy and a garden. Frank's daughter, Mrs. N. Sebastiano, who died recently at age 103, had related this information to Tom about the garden. A report from the Flynn Battaglia engineering firm was released to the Village of Williamsville detailing the condition of the Section House. A short article about the report was published in the May 14th edition of the Buffalo News. 1907 Williamsville Railroad Building. This is a good step in the right direction. 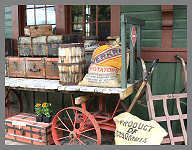 On May 19th and 20th we held our Annual Two Day "Garage Sale" at the Depot. Unfortunately, the weather was not our friend on Saturday but the skies cleared on Sunday which brought many more visitors. Beautiful flowers, household items, books and more were in plentiful supply. Everyone was very impressed with all the improvements inside the Depot. 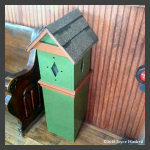 Our restored train order signal at the depot welcomed visitors with a "High Green" as they toured the grounds. 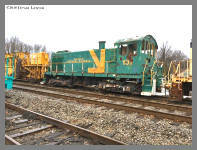 Our 1937 Lehigh Valley Caboose #95050, was open for inspection and squares were sold for our "Paint the Boxcar" campaign. Despite the miserable weather (chilly with rain, sometimes moderate to heavy), our major spring fund raiser, was surprisingly successful. Most of the vendors skipped Saturday morning, and a few skipped Sunday entirely. But the Krolick's Chicken dinners sold out, the plant sale thrived and the book sale, spurred on with a better display of fewer books, continued as an important profit center. The depot's own eight "Garage Sale" tables were jam packed with all sorts of items priced to sell (one small fifty dollar plus antique went for two dollars), while a separate area for more pricey goods was actually quite busy. Thanks to Joyce Haskell and Mark Breznay for all the great photos! 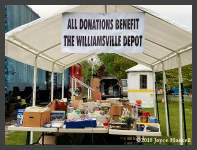 The Williamsville Depot would also like to thank everyone who came out to support us on the weekend. The vendors, the community and especially the Volunteers! 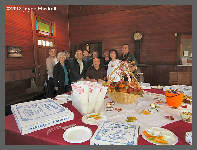 New visitors were impressed with all we have accomplished and will be back. Two years ago, Marty Bauer's Homewood Theater moved from its former Main Street site to the Williamsville Depot. This year, the performances on the 8th and 9th and 15th and 16th of the original play, "A Stop in Time", drew a record audience for a second time. The reception has been so enthusiastic that Marty Bauer and the cast have decided on two reprise performances, Friday July 27th and Saturday July 28th, with the show starting at 7:30 PM both evenings. Admission is $8.00 for adults while seniors and students get in for $6.00. The performance runs about an hour. 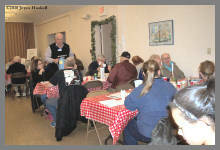 The Williamsville Committee participates with other non-profit organizations. One, "The Ten Lives Club", which arranges for adoptions of cats and dogs, was scheduled to hold its Pet Fair & Expo on June 23rd from 10am - 3pm at the depot. Concerns about a forecast of heavy rain and its effects on the animals, forced its cancellation. The Depot Committee offered the following Saturday (June 30) as an alternative but too many organizations could not attend on that date. 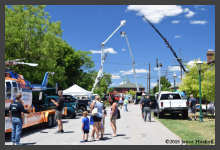 Immediately after Independence Day, our major event of the summer, "Touch a Truck at the Depot" again introduced children of all ages, and their families, to a variety of heavy equipment vehicles on Saturday July 7 from 10am to 3pm. Admission price was reduced to five dollars this year, as the ticket no longer included a hot dog and ice cream. Instead, we had three food trucks on site. The depot committee had soda, water and a few hot dogs for sale. Over 15, heavy duty, standard and old trucks participated in the event. "Mercy Flight" had their helicopter there and the Erie County Sheriff's mounted division made a stop. 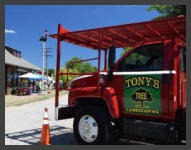 Many Thanks again to "Tony's Tree & Landscaping" for their sponsorship of the event. 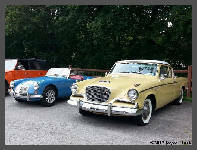 On Monday, July 23rd, we hosted another "Cruise Night" in cooperation with the Antique Automobile Club of America. This was our sixth year for this event. Cruise nights do not bring us a lot of income. Rather, they usually bring large numbers of people to the site who might otherwise never visit us. 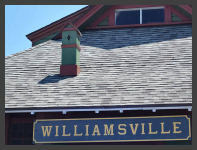 Williamsville Depot, it was approved by the Landmark Commission, and is now installed on the roof. Devan Lawton located the original Railway Express sign that hung on the west end of the building facing South Long Street. It was thought to be too valuable to hang outside on the building so a replica will be made. Once the Restoration Commission has approved the hanging of the replica on the building, the original will be hung inside the station. 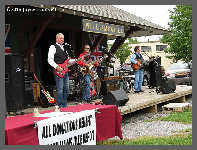 Look for another great performance by the "British Invasion" band on Saturday September 8th. This year, the Beatles Cover Band will be accompanied by "Acoustica". The concert, which was very well attended last year, is free, but donations are encouraged, and food is available. On September 21st & 22nd and 28th & 29th, the Homewood theater will be back with their Fall performance of a new Marty Bauer murder mystery, "The Case of the Haunted Depot". 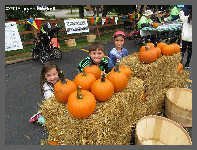 September 22nd will be a busy day at the Williamsville Depot, since Marty Visciano and other volunteers will be running our annual Octoberfest and Hay Ride from 10am to 4pm. Summer has come and gone. And Autumn is coming on. As we look back on our accomplishments and events of the year so far, and forward to what must be done before the snow flies, we realize that there are some things that we have done well and others that seem to get stalled or delayed indefinitely. The trees along the trail are turning a golden yellow, with some browns and a few reds, as this is written, most leaves will have fallen by the time you this issue of the FLYER, except for the leaves of the few Norway Maples, which only become brownish and do not fall until after Thanksgiving. Activity at the depot picked up considerably during September, starting with free concerts on Saturday, September 8th from 1:00pm - 3:00pm, the Lehigh Valley Depot came alive with the sounds of "Acoustica and The British Invasion" bands. Despite a rather chilly day, we had a nice turnout for this event. 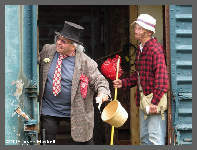 Suddenly, during the intermission between the performances, Boxcar Bob and Lehigh (Bob Lutot and Joyce Haskell), our two Williamsville hobos who we had not seen since last year, appeared out of the boxcar to entertain the gathered crowd. The group's performance was well received. While some of the audience came and left during the afternoon performance, many people stopped by to enjoy some or all of the show. This was an opportunity that we did not pass up: our volunteers busily solicited "Paint a Square" donations with considerable success. 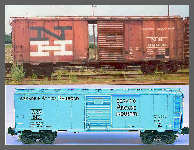 The "Paint a Square" option being offered to visitors is a grid is superimposed on a drawing of the boxcar. Donors can choose a site on the grid they wish to be painted with their donation. 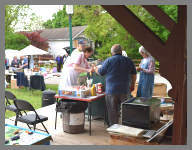 Hot Dogs and refreshments were available at the Depot. In the spring, The Homewood Theater Group's production of Marty Bauer's original play, "A Stop in Time", brought out the largest audiences ever. As a result, a third show for this season, "The Case of the Haunted Depot" with an expanded cast of six, was presented Fridays and Saturdays, September 28th and 29th, and again on October 5th and 6th, with 7:30 PM curtain times. The plot involves a mystery within a mystery, as The Homewood Theater Players return to the Village of "Oak Grove." Marty Bauer's Homewood Theater group is gaining a real following in Amherst. The Homewood Theater's profits are donated to help support the continuing preservation of our former Lehigh Valley depot, and more recently, toward the effort to bring an small locomotive to the depot so as to complete our short train. 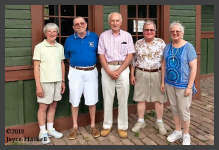 This desire has received support from the Village of Williamsville and the Town of Amherst, as well as the Village Historical Society, Marty Bauer's creative talents have become a vital part of our restoration program. 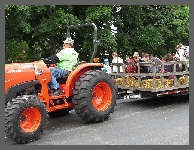 We concluded our summer season with hayrides for a fourth year on September 22nd. It was our introduction to October(fest). Marty Visciano again drove his multi-horse (powered) tractor pulling a hay-wagon. Last year the hay-ride was rained out in the afternoon. This year we had great weather and a remarkable number of riders participated in this enjoyable ride down the Lehigh Trail. For many years, we have sought to find a way to strip the accumulated layers of paint on the walls of the depot. Now, a new method has been found, purported to remove layers of mostly lead-based paint safely and completely. The procedure, done in timed stages, is expensive and best performed by workers experienced with the technique and removal of hazardous lead paint. The results on a test area behind the desk in the agent's office, proved the efficacy of the method, and was not defeated by approximately eleven layers of paint. 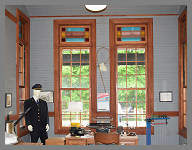 The Depot Steering Committee has proposed to have the wall on the trail side of the agent's office stripped as a demonstration while we raise the necessary funds to have the remainder of the agent's office stripped to bare wood and sealed. Thereafter, these walls will be stained to match the passenger waiting area. Devan Lawton, current owner of the porcelain-enamel "Railway Express Agency" sign that once adorned the depot, has graciously donated it to the depot restoration. 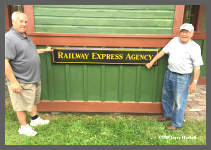 "After many years in Devan Lawton's collection, the original Railway Express Agency sign has been donated to the Williamsville Depot." Shortly after the Lehigh Valley Railroad abandoned the depot and before the expected demolition, the sign was secured. Devan stated that this is the rightful location for it to be placed, and was very happy to help in the continued efforts of restoring this fine station with its historical significance to the Village of Williamsville and the Town of Amherst. Considering that this particular sign is the original one from this station, it is a valuable and irreplaceable item. With Devan's approval, it will be mounted inside the depot and an exact duplicate will be fabricated and mounted in its original location on the west wall outside of the depot. 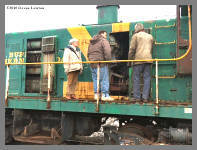 Ebenezer Railcar Services and they have agreed to donate a number of like new used replacement pieces. 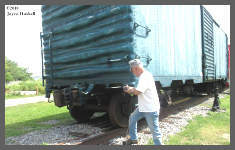 Larry has now marked the boxcar with yellow paint in the areas where the repairs are needed, and damaged parts will be removed and replaced with these like new used appurtenances from Ebenezer Railcar Services, resulting in a considerable savings to the Williamsville Depot restoration effort. Unfortunately, the boxcar and caboose are apparently attractive hazards. Larry's wife spotted four teenagers (two boys and two girls) on top of the boxcar, posing for an adult woman on the grass along the track, who was taking their picture. We have checked the video footage from the security camera and found remarkably clear pictures to identify these individuals, and have asked the Amherst Police whether any of them are known to the department. This is a liability issue. We will post more "No Trespassing" and "Private Property" signs, and check to see whether we can improve security camera footage of the area. One member suggested that barbed wire on the ladders might discourage climbers, while another jokingly offered a preference for concertina wire. Seriously, sheets of plexiglas affixed to the ladders so that there is no grip, seem to offer a better solution. While the "new" wood and coal burning stove is in the building, Tom Stackhouse has obtained an estimate for chimney repair and will seek approval of the Fire Marshall before we start work to fire up the stove to provide some heat in the building, as Autumn cold weather approaches. Progress on this restoration project has been slow but steady, thanks to a number of fund raising efforts. 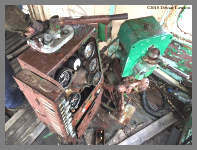 And a fund to bring an engine to the site has been started, thanks to Marty Bauer. a fire proof site on the floor of the waiting room for the newly purchased coal stove. The hot stove will be fenced off when in use, although the fence can be removed in the summer when the stove is cold to free up more space for events. For the same reason, our monthly Steering Committee meetings will be held again this winter at the Cleveland Heights Christian Church on Union Road. Preparations are being made for our tables at the Society's 37th Annual Greater Buffalo Train and Toy Show on November 17th and 18th. We will finish out the year with a Holiday Season Party on December 13th (second Thursday). The party is held to thank our workers, donors and others who have played important roles in our progress during the year. The party will be held at the Cleveland Hill Christian Church on Union Road. Lehigh Valley colors and with Lehigh Valley markings, some on the Historic Society wanted markings for the Arcade & Attica where the boxcar was used before its retirement, while others wanted it identified as New Haven, for whom it was originally built. Since almost all boxcars have black trucks, at least we thought we could start there. Oops, no. The Village is applying for a multimillion-dollar grant and our Depot site is one of the identified historic items mentioned. So, painting is on hold (until next year) awaiting a decision on the grant application. 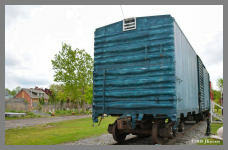 Our boxcar is currently painted green as the prior owner was going to convert the car to be used in an ice cream store. 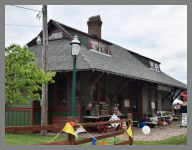 As discussed above, the Village of Williamsville is currently applying for grants and wants to designate the depot and section house as an historic site, which includes outside displays. As such, the State Office of Historic Preservation has certain constraints in painting the boxcar to conform with its historical use. Above are examples of the how the boxcar appeared as built for the New Haven and how it appeared when used for Borden by the Arcade & Attica. Now comes winter. Time to reassess our activities during the past year and plan for the next. Meetings of the Steering Committee will be back at the Cleveland Hill Christian Church, since the is no warmth in the depot. Hopefully, we will have that solved next year. Meanwhile, the Williamsville Committee wishes the members of the Society and their friends, a bountiful Thanksgiving and a Happy Holiday Season! 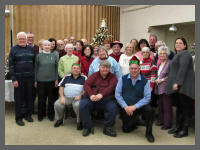 As we end another year, the members of the Lehigh Valley Depot Steering Committee hope that each and every member of the Western New York Railway Historical Society and their families have a happy and healthy Holiday Season. Just as we each look back on the accomplishments and missed opportunities of the year that has passed, and make our plans for the upcoming year, so has our Steering Committee reviewed the old year and set a schedule for the new. The box car has not been repainted. 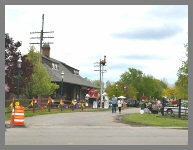 We were asked to hold off, pending results of a grant application by the Williamsville Historical Society in which the Depot is identified as one of the Village historic sites (although we do not know what, if any, benefit will be directed to the Depot site from the grant if funded). We have been told that we can paint it Lehigh Valley green. There had been some thoughts in the Historical Society that it should be painted for the Arcade & Attica, on which it ran for a few years. A safety barrier has been obtained to place around the coal stove, so this project can move forward in the upcoming year. Removal of many layers of lead-based paint and refinishing the underlying newly bared wood has been met with a lack of interest by the contractors who can do the work. Tom Stackhouse continues the search for a solution to this problem, including alternative approaches such as covering with new wood. John Bond is leading a search for waiting room benches that the Lehigh Valley used in passenger waiting areas, or for accurate drawings from which replicas could be produced. He has found photos of benches reputed to be of Lehigh Valley design. We have recently learned about some of the plans the Village Tree and Parks Committee has developed for the area around the Depot. With some probable land swapping, the Lehigh Valley Section House will remain on Village property. 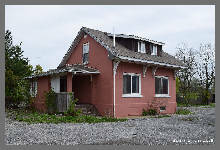 We may lose the parking area on the south side of the Depot, critical to many of our fund-raising events. The "zombie" house just to the south will probably be demolished. A new salt storage barn is to be constructed on the northwest corner of the Depot near the International Chimney garage near South Long Street. Until we see a definite lot plan, it will be difficult to determine the effect these proposed changes will have on the Depot. Our calendar for 2019 is already quite full, starting with participation in the Society's Train Show at the Hamburg Fair Grounds, February 16th and 17th. March 5th is the date set for a dinner at the Roadhouse Grill, while on April 6th we will have our annual spaghetti dinner fund-raiser at the Cleveland Heights Christian Church on Union road in Cheektowaga (all are invited). With the arrival of Spring weather, our Fifth Annual Garage, Book and Plant Sale will occur the weekend of May 18th and 19th. Come join us and shop. 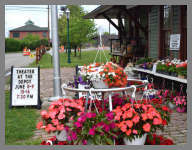 The Depot opens for the season on Sundays, beginning June 2nd, and Marty Bauer's Homewood Theater is tentatively scheduled to present a new production at the depot on Friday and Saturday evenings June 7th, 8th, 14th and 15th. On the evening of June 18th, we will again have dinner at the Roadhouse Grill, while on Saturday, June 22nd, the Depot will again host the Ten Lives Club Pet Fair. 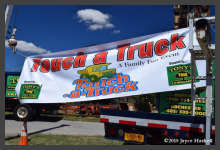 With the advent of Summer, we will again host a Touch-A-Truck event Saturday July 6th. This date was selected to avoid a conflict with Williamsville's "Old Home Days" the next weekend. At the end of July, we will host a Cruise night, Monday evening July 29th. August tends to be unpleasantly warm in the Depot, but on Saturday, September 7th, The British Invasion returns (hopefully, it won't rain again this year). Another dinner at the Roadhouse is scheduled for Tuesday, September 17th, and we welcome Autumn with our annual Octoberfest Hayride and events on Saturday, September 21st. The Homewood Theater returns with another original production Friday and Saturday evenings, September 27th, 28th and October 4th and 5th. The audiences for these performances have been continually growing. 2018 was another record year. We'll round out the year supporting the Society's Fall Train and Toy show, November 23rd and 24th, and finish with our Holiday party, Friday, December 13th. We wish all a happy, healthy and prosperous New Year. The Williamsville Depot Steering Committee is looking for people interested in the following: Construction & Maintenance, event planning, tour guides, marketing, data base management and finance/budget knowledge. We would welcome any and all help you may have to offer. Call the Depot at 716-633-7002 or eMail Marty V. Thank You!